Hello!! friends, today I am writing about the most popular android/iOS game i.e. Clash Of Clans. However, if you are a smartphone user then you would be quite aware about it. Well, if you are not, then you are not a true fan of smartphone games. Clash of Clans is a combat game which needs your intellectual attention. It is a whole combination of strategic plans, competitive fast-paced combats and perfect timing decisions. In this game, you need to establish your village, train your troops, build your glory and battle with other clans. It is the thrilling experience of battle that keeps you entertained. Supercell, the developers of Clash of Clans, would be proud of themselves after getting such a huge response. This game is available on android and iOS Smartphone OS but it would be a cream on pie if played on a big screen. Yes, you read it right!! you could install and play Clash of Clans on Windows or Mac PC. Just install an android emulator and experience the game on the big screen. Though, CoC (Clash Of Clans) is free to play but this game comes with some in app purchases that could provide you some extra features and strength. 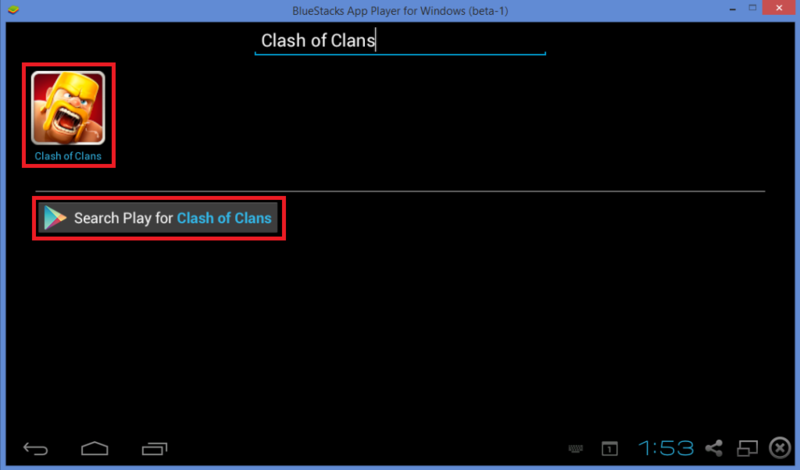 To learn How to install and Play Clash Of Clans on Bluestacks, read further. I have explained a step-by-step tutorial to play Bluestacks on Windows or Mac PC in this article. Download & install Bluestacks and Clash Of Clans game. 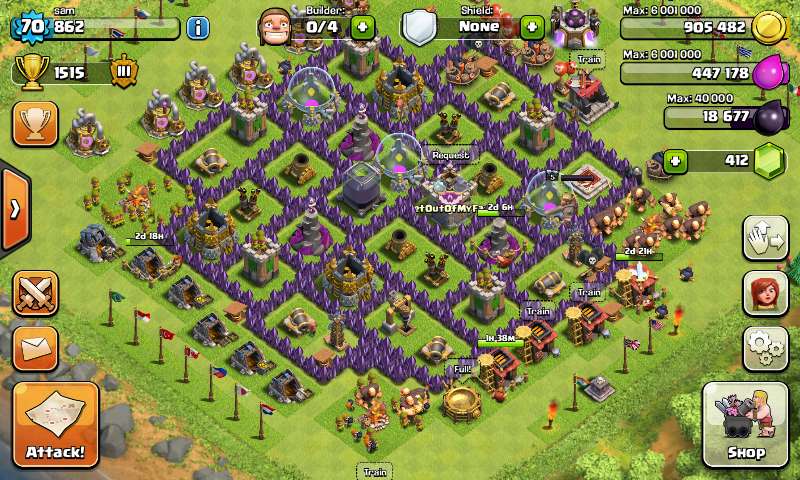 How to Play Clash Of Clans on your Windows or Mac PC. At first you need to install Bluestacks on your PC. Remember, you should have at least 2 GB RAM and a good graphic card to run android apps smoothly via Bluestacks on your PC. If your system does not fulfill these requirement then you can go for the alternatives of Bluestacks. Step 2: Download Bluestacks from the two links depending on your Windows or Mac PC as shown in the below image. Step 3: Follow all the steps and instructions to install Bluestacks on your system. That’s it. 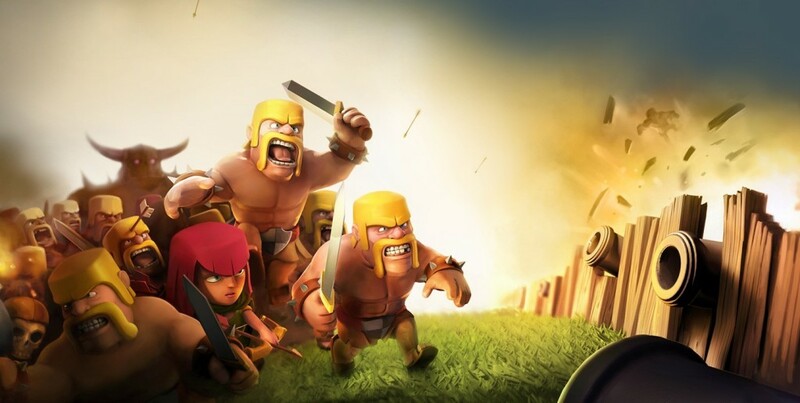 After successfully installing Bluestacks, you need to download and install Clash Of Clans. There are two methods to download and install Clash of Clans for PC. Prefer using the first one as it is the easiest one. Also Read: Resolve Error 1321 – The Installer Has Insufficient Privileges To Modify The File. Step 1: After installing Bluestacks, login with your Google user credentials to authenticate the Google Play Store. (You do not need any real android or iOS phone to complete this step, just continue with the credentials). Step 2: Now, go to the Google Play Store. Step 3: Search for Clash of Clans in the store and click on Install button. Step 4: Wait for the installation to complete. It would take some time. Step 5: After installation completes, go back to the main page and launch the game. That’s it!! Congratulations, you have successfully downloaded Clash of Clans on your PC. Now, enjoy Clash of Clans on your PC. Step 1: Install Bluestacks on your PC. 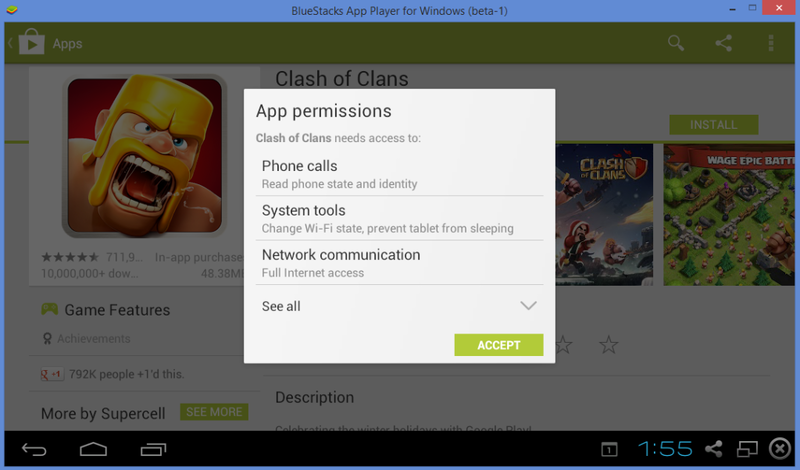 Ignore this step if you have already installed Bluestacks. Step 2: Now, download Clash of Clan apk file from the below link. Step 3: Double click the clash of clans apk file which you have downloaded. Bluestacks will automatically open it. If it does not open it then select “Open with Bluestacks” and run it. Step 4: After installation of Clash of Clans completes, open Bluestacks again and click on “My Apps” at top right of the screen. Then, click on Clash of Clans icon. Step 5: Follow the onscreen instructions of Clash of Clans for PC. Now, that you have done downloading and installing of Clash of Clans in your Windows or Mac PC… you can load up your village and play the game. Remember to play through this tutorial first or else you would not get the settings button the right. For Android Users: Start CoC (Clash of Clans) and click on settings. Then, click on Google+ button. Log into your Google+ profile and you can simply load up your village. There would be a prompt that ‘Do you want to load Chief Your Name’s Town Hall 8 Village’. For iOS Users: Load CoC (Clash of Clans), click on settings. Then, click on Google+ sign in. Create an account and log in. Now, link your iOS device with Bluestacks. The rest of the steps are self explanatory. So, just follow it. Rest options: The rest options can be held by your mouse. I have come through complains of Bluestacks Black screen error while playing Clash of Clan. To fix this issue, visit the below link. Previous articleHow to play psp games on ios using psp emulator | iphone, ipad.